Pumpkin Loaf, and Fun New Jobs. I think it’s safe to say that I always have a project on the go. I’m adding new things to roster all the time, and currently I juggle 6 jobs. Some of them pay, some of them don’t, some of them are things I love, and one of them, serving at a restaurant, is something I do just to make ends meet. It’s a hectic life. But it’s a fun one. As he’s working out the kinks of the cart, he’s parking at the corner of Union and Jackson (right on the Strathcona bike path! ), and if you’re passing by the area, you should probably pop by, drink some coffee, and perhaps get a pastry that I’ve baked. 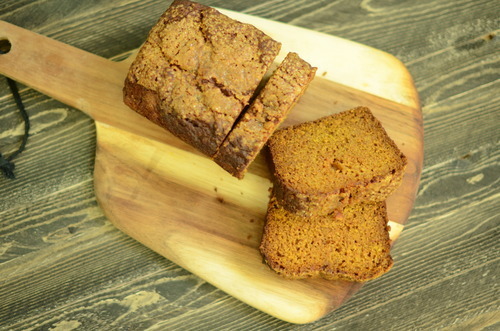 And if you don’t live close by, and can’t get a slice of my pumpkin loaf, you should definitely make some yourself. 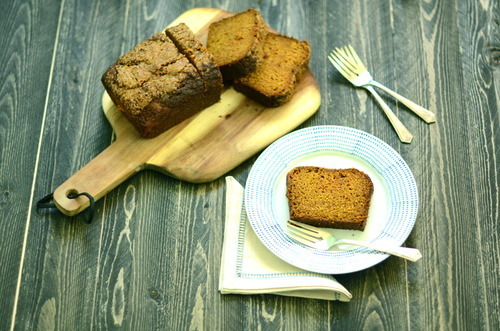 It is so moist, and so simple to make, and it just feels like fall. It makes a great breakfast with a coffee in the morning, but it’s also darn good slightly warmed before bed, with a cup of tea. Coarse Sugar to sprinkle on top. In a large bowl mix together to the oil and sugar. Gently stir the dry ingredients in until just combined. Pour the batter into the prepared pan and level with a spatula. Sprinkle the coarse sugar on top and cook until an inserted skewer comes back with only a few moist crumbs- about 30 minutes.